And here we are, another fresh DirectX11 release, which gives a nice 1.3 bump. TextureFX, with it's latest update, had an eventual issue when patch starts in disabled mode and would not recover from it. .They are all faster in that scenario. Reflection is now performed only on compile (no technique swap penalty), and general better runtime performance. Now technique can have the annotation : wantmips , this avoids to make your own mip pass (runtime will do it for you, and will only do so if input texture requires it). New pin "Preserve On Disable" (spreadable). This allows (When Enabled pin is off), to keep last frame result instead of routing input. Presets internal handling is now less error prone and faster. New documentation pages inhttps://github.com/mrvux/dx11-vvvv/tree/master/Docs . For now full semantics and annotations reference. I of course wanted to say thank you to people who did either a Patreon subscription, or by doing private yearly invoice. There is now an About (DX11) node, which has the names of all Contributors and Supporters. For next release, the main aim is to upgrade to latest version of Assimp (and it's c# wrapper). This will allow to import the newly supported formats (gltf), and use more complete wrapper version (specially for loading options). Please note that latest Assimp binaries will be incorporated in next alpha build (github). Framedelay (2d and 3d) were not disposing resource when deleted from patch. Framedelay (2d and 3d) now also start render graph (as part of update stage), and do not evaluate upstream anymore when disabled. New blend state presets (available in Blend and Renderstate nodes) : MultiplyAlpha (only multiplies alpha channel, leave color as it it), ReplaceAlpha (leave color and set new alpha), BlendDestination (uses alpha in the render target instead of pixel shader ouput as factor, for opacity masks). Add EnableScissor (DX11.RenderState) : Allows to modify state to enable scissor, without touching the rest. All state nodes now use static enum instead of dynamic string based version, which increases performance for those nodes (no more lookup needed). Add GetRigidBodyCustom(Bullet) : Allows to get custom pin of a rigid body. Add BoxContainment(Bullet Rigid.Filter) : Allows to filter rigid body list if they are inside or outside a bounding box. Add SphereContainment(Bullet Rigid.Filter) : Allows to filter rigid body list if they are inside or outside a bounding sphere. GetConstraintDetails(Bullet) : Now outputs related body. Gesture (Kinect2.Microsoft) : Now allows to specify user index manually, instead of using first found skeleton as before. GetArray (DX11.TextureArray BinSize): same as above, but with bin size (allows combining), contributed by @sebl. Texture FX cache is now more efficient, no more penalty when switching techniques. Texture FX has a new option "Preserve On Disable" (spreadable), if Enabled pin is off, keeps previous frame texture instead of passing texture In. whenever you have an update, simply modify the wiki-page or send us another email. we'll also periodically send out an email to ask you to confirm your information is still valid, to keep the list up-to-date. so if you're a teacher, please send us your information, if you're a student please ask your teacher to do so. if you know someone who should be on the list, please let them know about this. sun sun sun, here we come! Check out its website for all info. It is all great and shiny with only one caveat: unfortunately the number of people we can host is limited to 25. This is why we have to run a simple application process and depending on the number of applicants we will have the difficult task to tell some of you that they cannot come. booohh..we know. Please don't hesitate to apply though, we're hoping to assemble a group of not only the usual suspects but also to get to know some new faces! Also if you cannot attend for the whole time, join us on the public sunday. More information on the website. Convinced? Then go and apply here directly. Or microdee's keynode aka long article about what's going on aka "oh no microdee's hyping his own stuff again". Since September in my freetime I've been working on major refactoring of my packs to be more accessible and more organized and also writing more documentation, help patches and more understandable girlpower while also improving on features and fixing bugs. This all started with unifying semantics and pipelines in mp.fxh and mp.dx shaders but because of my slight bipolarity I've finished a lot of things since then except that. So there are still some inconsistencies on that side and the fate/direction of the rendering part is still hanging up in the air (that PBRBase thing and the Disney shading). I'm a single person on this so it'll take some time. Meanwhile I've started to make my C# backends 99% independent from VVVV*, started to properly build them on Appveyor and properly publish them automatically to Nuget. The first materialized result of this is md.stdl (microdee's standard library) which is a collection of some common functionalities used often during development (sort of like the VVVV.Utils library, just on my own). More and more features will be ported from mp.essentials nodes to md.stdl. An exciting side-effect of this that md.stdl can be inherently used in VL by its magnificent Nuget support (though I didn't have the arriving to test it properly yet). currently md.stdl still depends on VVVV.Utils with Mouse and Keyboard devices. All it does though that it provides some classes to act like the Desktop Mouse and Keyboard nodes. Also provides interoperability extension methods for VMath vectors and System.Numerics vectors. Another library, which was separate, then merged into mp.essentials, then grown out of mp.essentials again but this time properly and has its own Nuget now: is mp.pddn (mcropack pin dictionary dynamic node) which is an extension library for creating VVVV nodes with highly dynamic pin management. One of the direct results of this were the introduction of the truly generic VVVV node pattern in mp.essentials and Notuiv (see below) where you can still be type-safe but can manage any type with a single node without the need for VL or C# code. VVVV is used to create large scale user interfaces a lot. Anything requires a screen and user interaction VVVV scales in size like no other package does from lot's of tiny screens to huge LED walls the size of a building (or your mom), VVVV can handle that with breeze. Except any professional will know that developing UI logic which people are taking as granted from browsers or smartphones are painful to develop in VVVV's dataflow environment. 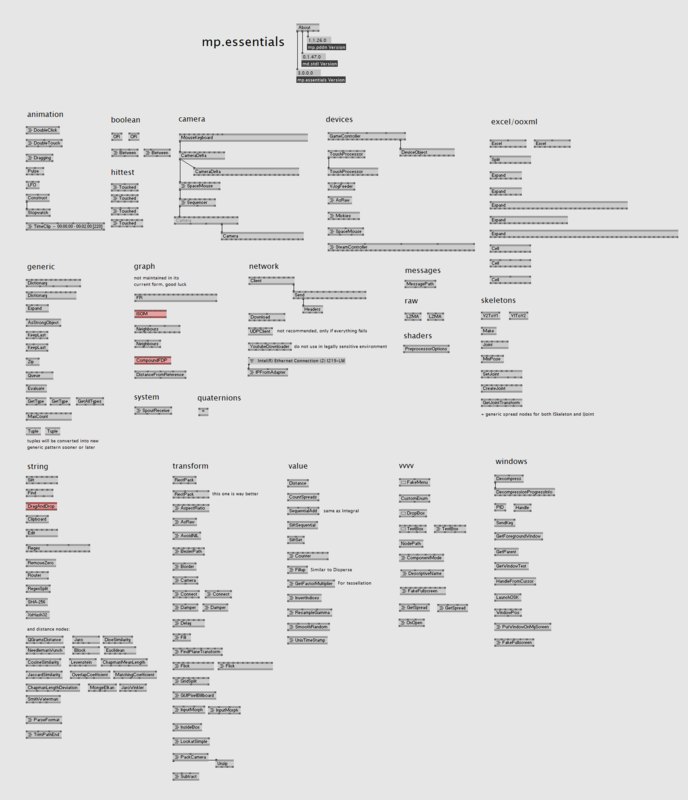 The shear presence of overlapping UI elements can make your brain explode in pure VVVV. In the past I had several attempts to solve it and they all failed for various reasons (khmvobjectskhm khmvoogkhm). Those shalt be forgotteth and shalt be never spoketh thereof. Learning from those mistakes, and still repeatedly fighting with the above mentioned incomprehensible logic cobwebs suffering from deadline induced chaos and doom, I came up with Notui. Notui is a UI behavior package written entirely in C# providing a robust skeleton for your UI elements. The intention here was to keep VVVV's vast drawing capabilities while eliminating the above mentioned horror with logic. The result is a mostly dataflow friendly system which separates structure, stateful-logic and rendering. Note also that Notui is a C# library first and Notuiv is its VVVV implementation. This again means all the features of Notui theoretically can be accessed in VL and simply fetched from Nuget.org. This also means that you can patch your own element types and behavior delegates in VL, but I'm ahead of myself. I hear you saying "Yeah, yeah tl;dr, big words, etcetra etcetra, What are its features?" An elephant in the room: "But have you heard of CraftLie?" CraftLie is super great and tonfilm even created pure C# VL.UI.CraftLie https://github.com/tebjan/VL.UI.CraftLie which at first glance does very similar things as Notui. Unfortunately though the scope is quite different. But nothing stops you to combine CraftLie and its UI thing, VL and Notui to have a powerful system, if you install Notui into VL through Nuget, or just reference Notui.dll from vvvv/packs/Notuiv/nodes/plugins folder. This is kind of untested area yet, so please give me feedback how it went. Side note: Now for those who want to use Notui outside of VVVV don't get fooled or intimidated by the lines of code count of Notuiv implementation, that amount of boilerplate code is not a Notui specific phenomena . It's an inherent structural issue with how VVVV works. 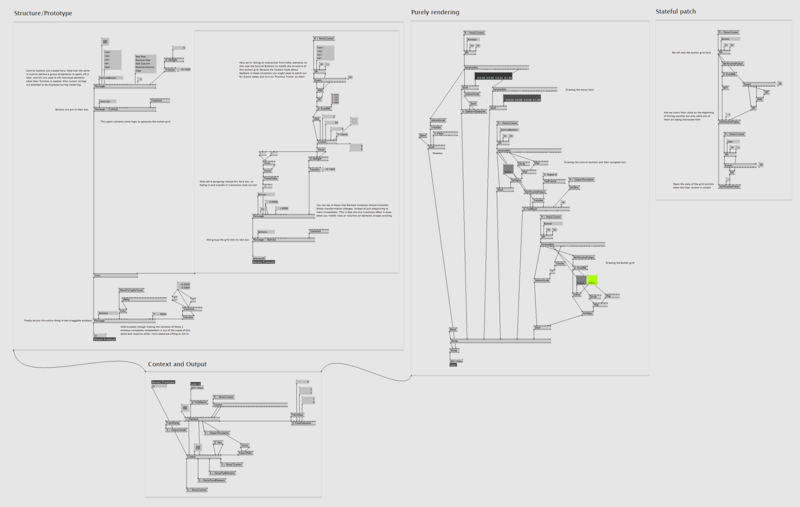 It's a general rule of thumb that if you want to implement a large library solving a big set of problems in a very modular way with lot's of information on their building blocks, VVVV's plugin interfaces requires thousands if not ten-thousands of lines boilerplate to deal with all the conditions a plugin can have. This is 100% solved in VL though. 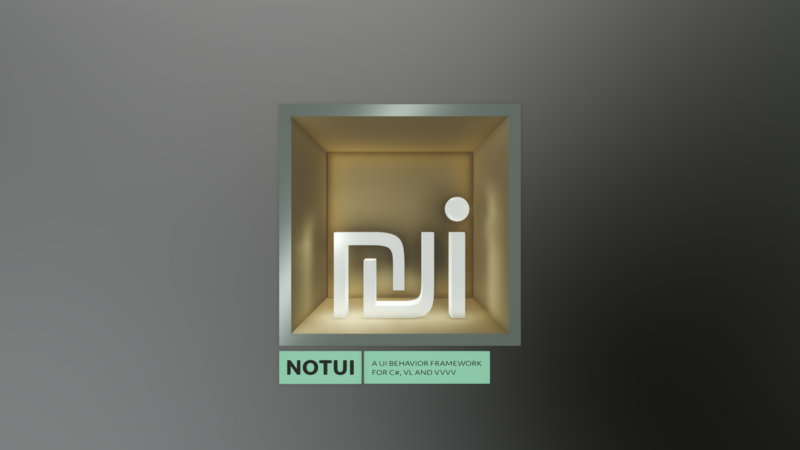 Disclaimer on the logo: Notui have nothing to do with Israel's new shequel. That symbol just looks great and resembles an 'n' and a 'u' interlocked, throw in an 'i' and you'll get Notui \o/. But if anybody feels offended by this for any serious reason (like if an Israeli person really feel like their national currency symbol is being abused by random UI libraries for simply aesthetic reasons which has nothing to do with it, or with Israel) I'll immediately change it. First: FBX4V will be open-sourced soon and will become part of mp.dx, and maybe I'll find some time to fix some crucial issues with it during the process. Second: the refactoring also ended up in a more modern way of deploying my packs. (like how Velcrome's messages and Vux's DX11 packs are doing for ages. All md.ecosystem packs are still available from vpm, but their binaries are finally not stored directly in their repo, and they are available from Github releases for those who are not happy with vpm. vpm itself will be revisited soon as I need to sort out couple of things to fit more into automatic deployment schemes. Also finally because of Appveyor they're all generating version.info files now and also they have About nodes with detailed versioning info too. 2.5th: During this transition I'm also creating nice and tidy help patches with lot's of reading materials where it's suitable and the node has a decently isolated function. So hopefully it will result in less confused patchers. Third: A reminder that all of my stuffs are open-source on Github, one can easily fork it and send me pull-requests. Yet I can count on a single hand the number of occurrences this happened. If there's no active project with a deadline MESO embraces open source development which can help faster realization of future projects (the reason you have Notui now) so funding wise I'm ok, BUT I'm a single guy maintaining this entire thing, so if you're bored and can do vvvv patching you'll make me the happiest guy on earth if you send me pull requests to my repos fixing minor issues I haven't noticed or improving on my crappy code/patch. Thank you for reading this through, I hope my packs provide you as much productivity as they do for me. If you have any questions I usually answer them. Welcome dear patchers to a new episode of devvvvs giving you control over your PC mainboard. When you work in vvvv or VL the evaluation of your patch is automatically driven by a mainloop. It executes the nodes in your patch (usually) 60 times per second and by this allows changes to happen in your patch over time. Those flickers indicate that the time between two frames of the mainloop is changing a bit every frame. In an ideal world those flickers would not be there and the time between two frames would always be the same. An unstable mainloop like this creates jitter in animations, drops video frames and lets the visual output of your patch look less smooth. The experience gathered from the vvvv mainloop improvements is now available in the VL library, so you can build your own sub-mainloops. In VL the patch of a process node by default has a Create and an Update operation. Create gets called once an instance of the process is created and Update gets called periodically by the mainloop. In this process node patch you can place other process nodes that 'plug into' those two operations by placing their own Create on the Create of the surrounding patch and their Update on the Update of the surrounding patch. The use of observables also makes it easy to swap one timer for another if neccessary. Basically there are 3 ways to setup timers in windows and now VL has them all! Since its possible to measure time with high accuracy, one can write an infinite loop that always checks the time and executes an event once the specified interval time has passed. This timer always uses 100% of one CPU core because it checks time as often as it can. But hey, how many cores do you have these days? With this method you can achieve precision in the micro second range, which is insane! This timer has an option to reduce CPU load for period times that are higher than the accuracy of your system timer. You can specify a time span called Wait Accuracy. This is a time span before the desired end of the period that specifies when the busy wait phase should start. Before that time the timer is set to sleep for 1ms periodically. 16ms is a safe value, but you can decrease it until the Last Period starts to jump in order to reduce CPU load even more. Both the MultimediaTimer and the BusyWaitTimer start their own background thread with priority AboveNormal. The thread priority setting might become an input pin in the future. So now download latest alpha, enable the Experimental button in the VL node browser and give it a shot. If anything unexpected happens, let us know in the forums. Berlin, London, Saint Petersburg, Athens and Linz this summer! In 6 days, these courses will give beginners a solid grip on vvvv basics and interactive tech. beta36 is out, after only a few months overtime, packed with new features. please read the release notes carefully to learn about all the goodies. judging by the >100 downloads a day and not too many crazy bugreports since, i think it is fair to say at this point that it turned out well. if there is still a particular reason you're using an older version, please make sure to let us know about it! are you into computer-vision? wanna see one particular thing you can do with beta36? check out our first episode of vvvvTv in which we cover a new computer-vision library for vl available as a prerelease now. planning your summer travels? save the date for LINK - the vvvv summercamp! and a new book it out about learning vvvv: it is in chinese. so only the majority of people on earth now got a chance to get in touch with vvvv, horray! many thanks to the authors for their dedication! two new ones by new user Bartuc, welcome! or just wanna take a vacation on a beautiful island teaching some vvvv/vl? have a look at this offer by io. and don't miss this poetic project digital-dandelion posted by zepi! dominkKoller is back on it and brings the vvvv Academy on Tour this summer. he's planning several full courses in different cities. follow @vvvvAcademy (or just this blog here) to stay tuned. Attention patchers! Save the date! We're planning to spend some good times. Save the date for LINK, the very first VVVV summer camp. The summer camp will take place from August 8th to August 12th this year at a wonderful and peaceful sight near Berlin. The camp will be a short vacation from your everyday life, a time for ideas and projects you never found the time for. You are willing to bring your ideas and developments and this communtiy further? Then this is the place for you! Nota bene: There will be only a super limited amount of seats available. The summercamp is not like an academy or workshop. You are not coming to learn. Here you are coming to share and spend quality time together while bringing forward your developments and ideas for future developments. Expect 5 fantastic days at the lake with tents, barbecue, wine and overheating notebooks. So save that date now. Details on everything and how to apply for it will follow soon here. VL: OpenCV is in da house! remember the amazing ImagePack initiated by @elliotwoods years ago? VL.OpenCV is essentially the same, only for vl: a collection of nodes for computer-vision tasks based on the industry standard library OpenCV. OpenCV is a vast library with an endless number of interesting features. elliot back in the days did a great job in hand-picking some of the most interesting ones and wrapping them into easy to use nodes for evvvveryone. meanwhile OpenCV has progressed and so we thought we'd give it a try and make it accessible for everyone in vl. watch this first episode of vvvvTv where ravazquez who has been working on this for the past 2.5 months, explains how you can use the prerelease package today. 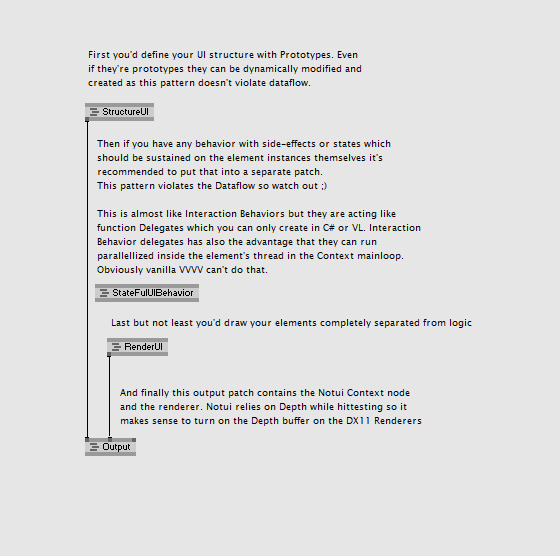 and most of the nodes and pins come with documentation in the tooltips! as opposed to the ImagePack, this library is completely free of the complexities of threading. instead a user can use the threading regions of vl to define their own threading. while this indeed puts a bit more effort on the user we hope that the flexibility in dealing with their own threading outweighs the cons of this. the library is open for everyone to contribute. since it is mostly done in pure vl, with hardly any c# written, it is quite accessible for everyone to extend. so please do so and best join us in the chat to discuss matters when they arise.